Tall, elegant and stately spires of flowers, delphiniums are a timeless cottage garden favourite. Full of colour and very effective used as a back-of-the-border subject, the Centurion Series is one of the best we’ve seen, rivalling, and even surpassing, more expensive cutting-raised varieties. These strong and sturdy plants are very free-flowering with spikes which are well-branched and full of large, dreamy semi-double flowers. First-year-flowering perennials, expect plants to bloom this season in late summer. 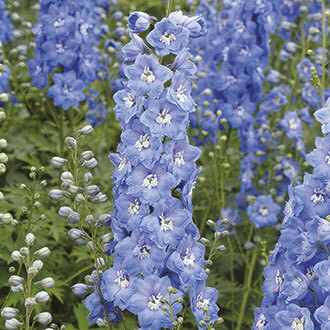 Delphiniums were given their name by the ancient Greeks who thought that the flower bud looked dolphin-like. Grow in full sun, in fertile, well-drained soil. Very easy to grow, they don’t require staking. Hardy perennial.